Anne Martin & her team have been restoring, french polishing & re-upholstering antique and modern furniture since 1985, originally in Stirling, then Kinbuck near Dunblane, before moving to the old Tower Hotel in Clackmannan near Alloa. Most clients are local to Clackmannanshire & Hillfoots, Stirling, Falkirk, West Fife, Perth & Kinross areas, and further afield. 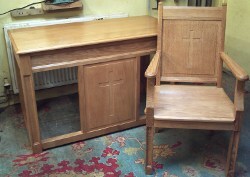 Anne's background is in antique restoration & conservation. Our skills have grown & diversified over the years to meet more unusual requests, such as restoring life size carved black forest bears, a silver cross pram, an altar table, judo club matting, yacht seating and ‘cinema’seats. Our clients include the Stirling Smith Art Gallery and Museum and Victoria Hall, Dunblane. 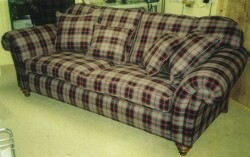 We can supply a wide range of upholstery fabrics & leathers. 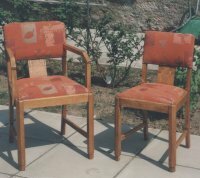 Today, as well as treasured heirlooms and auction snips, we are kept busy restoring modern classics, such as G-plan, Nathan, MacIntosh, Meredew, Priory, Ercol, Ducal, Parker Knoll, Cintique, Reid, Duresta, as a growing awareness that many timbers once in abundance are unobtainable today, and the folly of putting quality furniture to landfill. Our French polisher is skilled in matching colours and finishes; we can often alter wood shades to your requirements. Choose from an extensive range of performance tested Upholstery Fabrics & Leathers to transform your old upholstery. A collection & delivery service is available for larger items or the housebound.